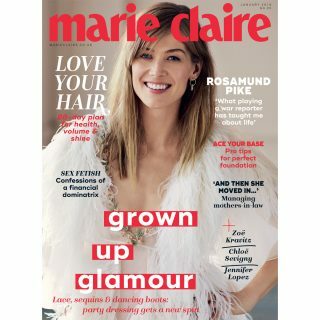 comps.marieclaire.co.uk is managed by DMRI on behalf of TI Media Limited. Competitions are open to anyone aged 18 or over based in the UK except for employees of TI Media Limited. and DMRI. When entering the competitions, you will sometimes be given the option to opt in to receive marketing communications from the prize sponsor. This does not affect your entry into the competition and is completely optional. If you do opt in to receive such information, your contact details will be passed to the prize sponsor for this purpose. During the process of entering it is likely you will see advertising from companies not related to the competition. It is optional if you opt in to receive any information relating to these offers. In some cases, you may be required to view a promotional video in order to complete your entry. Further information can be found here. All competitions are free to enter. However, participants are expected to pay their own cost of connecting to the web site. For 'Prize Draw Competitions', you must successfully select the correct answer to the question from the multiple choice answers given. Should you select the correct answer you will automatically have gained one entry into the prize draw from which winners will be randomly selected from all of the correct entries into that particular prize draw. Winners will be drawn and notified within 28 days of the closing date by email. To be a winner of the 'Instant Win Competitions', you must successfully match a sequence of numbers selected at random by comps.marieclaire.co.uk. Should your numbers match the combination you will be redirected to a page notifying you that you are a winner. To claim your prize you must contact THE WINNERS LINE on 0114 201 1410 (Calls will be charged at National Rate) between office hours within three working days from the date of your win to register your claim. You will be asked to verify your name and contact details before it will be deemed a valid claim. This telephone number is for prize claims only and if you wish to contact comps.marieclaire.co.uk for any other reason please use the competition contact form. Messages left on the office answer machine (in operation outside office hours) will NOT be deemed a valid claim and you will need to call within office hours. An exception to this rule will apply during Christmas and The New Year when the office may be closed from 22nd of December for a period of more than three days. Please allow up to 28 days for delivery of prizes from the date of validating your claim or being informed you are a winner via email. Claims are only valid if the winner's name and address are on the electoral roll. It is the winner's responsibility to ensure their contact details on the site are correct and up-to-date. Prizes will be offered by comps.marieclaire.co.uk and 3rd party companies. If a prize is offered in conjunction with another company and the other company withdraws or fails to provide it, comps.marieclaire.co.uk will not provide the prize itself. Any special terms and conditions associated with this type of prize will be displayed on the entry page below the competition. Unless otherwise stated, comps.marieclaire.co.uk reserves the right to substitute a cash prize for the chosen prize to an acceptable value alternative. This is at comps.marieclaire.co.uk discretion. This occasion may arise when an advertised prize on the site is no longer available, but it is not the responsibility of any 3rd party company. Otherwise prizes are as stated. If a participant receives a winner notification in error, then no prize will be due. Any participant found to be using robot forms to enter a competition will invalidate their entry to the competition and will be disqualified from the competition. Prize winner's details will be displayed on the website as first name or initial and surname only e.g. Susan Smith or S. Smith. Any images and names supplied will be deemed to have had any copyright ownership transferred to comps.marieclaire.co.uk Magazine and comps.marieclaire.co.uk and may be used for future promotions. Members of the Competition Club can only enter individual competitions once daily. This may be changed in the future. A limit to the number of total entries per member allowed within a daily or weekly period (Monday 00:00 to Sunday 23:59) will also be set. This information is displayed on the homepage when a member is logged into the site. Any changes to prize draw frequency or allowed daily/weekly limit may occur without notice and are solely at comps.marieclaire.co.uk discretion. Multiple accounts for individuals are not allowed, and members registering multiple accounts may have any number of their accounts and existing entries deleted without prior notice. Any entries made using a duplicate account will invalidate claims to prizes. All competitions may be subject to additional rules. These will be listed in the special terms and conditions buttons on the competition entry page. No correspondence on any of the rules above will be entered into. Please note we will try our hardest to contact winners and deliver prizes however if we are not able to get in touch with you we reserve the right to re draw the winner(s) and allocate the prize to someone else. This is most likely to occur but is not limited to time sensitive prizes or where a choice of prize(s) is available. Please ensure when registering and entering competitions you provide a contact telephone number as well as ensuring the email address you are registered with is up to date to minimise the possibility of this happening. These rules will be governed by English law, and you submit to the exclusive jurisdiction of the English courts.